The photo shows two stamped tin boxes each containing 5 Time-pencils that was airdropped to the Danish resistance during the Second World War. On top a roll of Bickford fuse with a crimped detonator and a safety match igniter all ready to go. Note the inserted No. 27 detonator in the white time-pencil to the right. The “Signal Relay” or Switch No.10 commonly known as the “time-pencil” is a small and compact delayed-ignition device that could set off a detonator or a Bickford safety fuse. The “Signal Relay” was secretly invented by Cdr. A.G. Langley before the Second World War and he further developed and improved it ending up with the product that we know today as the Switch No.10. After the war Cdr. A.G. Langley was credited for the invention by the British Royal Commission on Awards. It was widely used during the war by S.O.E. operatives but certainly also by the O.S.S. (Office of Strategic Service). Millions of time-pencils were produced by various contractors, a lot of them in the U.S.A. on behalf of OSS. The U.S. produced was called “Signal Relay American” (SRA) or simple, Time Pencil Mark I. It is generally understood that the glass ampoule contains acid and that it is the thickness of the steel wire that causes the various delays available. This is however not the case. The steel wire has the same thickness regardless of the delay. The pencil is composed of three different sections. The copper tube contains a clear glass ampoule filled with a green liquid being copper chloride and the brass tube is housing the striker, coil spring and a primer. Also aluminium tubes can be found as a substitute for the common brass tube depending on who manufactured the pencils. Sectioned time-pencil. Note the thin steel wire running along the ampoule of copper chloride. The cotton wads serves a dual purpose; to protect the ampoule against hard handling during transport and when the ampoule is crushed absorb the copper chloride to ensure that the wire is fully submerged regardless of the position of the pencil. Also notice the circular inspection hole next to the safety strip. Shown from left: primer, striker, coil spring, ampoule, lead disk, retaining screw and in between the steel wire. Drawing from; “Special weapons and devices research and development branch Office of Strategic Services Washington June 1944”. At the end of the brass tube, a spring snout is mounted which allows a detonator No.27 or a Bickford safety fuse to be inserted. The interior wall between the copper and brass tube is perforated by a 0.02 inch (0.5 millimetre) hole, in which the steel wire holding the striker under tension runs through. The other end of the wire is fixated to the screw and lead disk on the top of the copper tube. The total length of the pencil is 5 inches (127 millimetres), the diameter is 0.31 inch (8 millimetres) and the weight is 0.65 ounce (18.5 gram). Different contractors were involved in the production, fore example; the copper chloride capsules were made by Boots and British Drug Houses and the spring snouts were made by Stephens Pens and the whole fuse was assembled by Joseph Lucas Ltd., Birmingham. Arming the time-pencil is done by squeezing the copper tube with the fingers, hereby crushing the glass ampoule inside. The solution of copper chloride is released and will submerge the steel wire. If the safety strip hereafter can be removed without any friction, the time-pencil is armed. If the safety strip can’t be removed, it is because the steel wire has broken and thereby released the striker which is now resting on the safety strip with high tension caused by the spring. For ease of inspection, one or two inspection holes have been drilled next to the safety strip. Fe + Cu2+ -> Fe2+ + Cu. 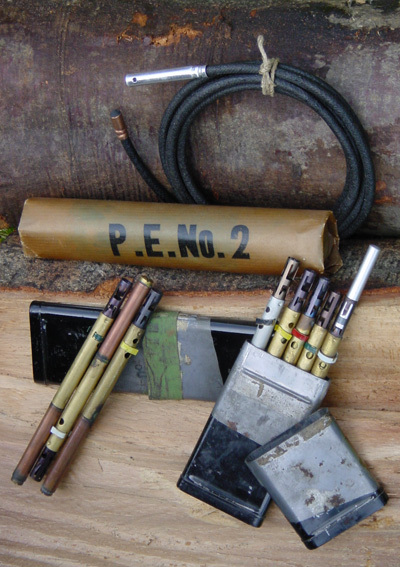 Shown in the photo is a time-pencil with an attached Bickford fuse with a No.8 detonator crimped at the end, timed for action within 10 minutes. The advantage in using the Bickford fuse is that the operator will have a safety margin if the switch should fail and fire in the second the safety strip is removed. A Bickford fuse burns 0.40 inch (1 centimetre) per second leaving enough time to extract the detonator from the explosive. Note the extracted black safety strip and the two inspections holes. The period of delay is indicated by the colour of the safety strip. The timings given are for 59° Fahrenheit (15°celcius). The delay varies according to temperature. At high temperature the delays are considerably shortened and visa versa. Each tin was packed with 5 pencils all with the same colour code. It was then sealed with a coloured strip of duct tape corresponding to the colour on the safety strips. For illustration purposes I have mixed the various colours. Today the time-pencils are very attractive items for the serious Second World War collector with prices easily ranging from £20 to £55 for each pencil, the blue and blacks being the rarest. Aston House – SOE Station XII - Des Turner, 2004. Descriptive Catalogue of Special Devices and Supplies 1944 - M.0.1. (S.P.) The War Office. Enemy Sabotage Equipment (Identification), Second Edition May 1945 - The War Office. Sabotage Pamphlet - Air dropped in the occupied countries. Secret Agent’s Handbook of Special Devices - Public Record Office, UK, 2000 - ISBN 1-903365-00-7. SOE the scientific secrets - Fredric Boyce and Douglas Everett, 2003 - ISBN 0-7509-3165-5.